She continued, “Since we are here in a hotel environment with fire hazard issues, we focus on devotional bhajans, japa, pooja, aradhana with a pure heart invocation of the Mata Ki Chowki”. What is noteworthy, Mata ki Chowki can be done at any time on any occasion by anyone. 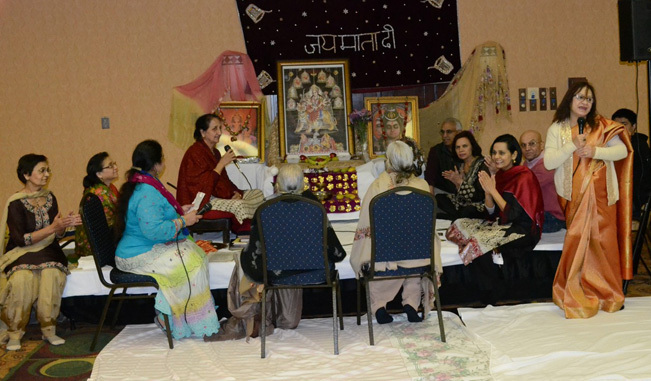 The Senior Citizens Program (SCP) thus got off to an auspicious New Year start with a spirited and joyous Ganesh Poojan followed by the traditional lighting of the Jyot at theGardenPlaza, in Norcross on Sunday, January 14, 2018. 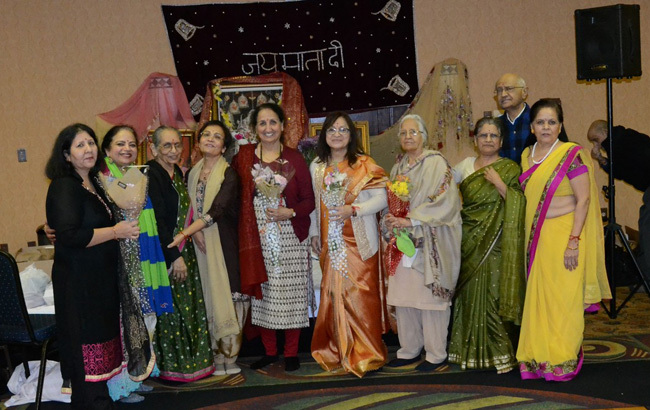 The Mata ki Chowki, sponsored by SCP’s long time and dedicated volunteer Chinti Bali, along with Sunanda and Varjinder Sharma, Ashok and Poonam Datta, Jagdish and Santosh Shailly, was musically led by Atlanta’s popular and devoted Mrs. Rewa Handa Group. The gracefully decorated stage with diyas (lamps), stringed lights, fresh fruits and prasad (offerings) wore a festive look in its ornate finery with Mata’s dazzling framed picture in the center of the Puja platform, with colorful fresh flower garlands, together with pictures of Lord Ganesh and Lord Shiva. After warm welcome and good wishes for the New Year, SCP’s Executive director Raj Razdan invited Mrs. Rewa Handa to take charge of the Mata ki Chowki (offerings, prayers, bhajans, mantras, etc.) in glory of Goddess Durga. Rewa Handa along with members of her group, invited the sponsors Jagdish and Santosh Shailly along with Ashok and Poonam Datta and the SCP Yajmana Rohitbhai and Shardaben Patel to perform the Pooja rituals, starting with sankalp and followed by avahanam (invitation) to divine Mataji (Sherawali Ma – who symbolizes the holy trinity of Goddesses Durga, Lakshmi and Saraswati), then Ganapati Pooja, (worship to the remover of all obstacles), Lord Vishnu Pooja, Nava Graha Pooja, and Lord Hanumanji Pooja. This was followed with ‘jyot’ ceremony, garlanding and draping of the ‘chunari” on Mata ji in reverence. The singing of bhajans by the gathering accompanied by clapping and hypnotic beats of the Dholak by young Nikhil Sharma and cymbals by Rithu Lalwani generated uplifting spiritual vibes. While the poojas were going on, Raj Razdan and Balwinder Kaur went around the hall tying red sacred thread and applying tikka to the attendees. The congregation sat in rapt attention listening to melodious bhajans (divine songs) and praises of Mataji in mellifluous voices by Reva Handa, Kshama Kakade, Rithu Lalwani, Shardaben Patel, etc. As the fervor picked up with clapping and singing, congregation joined in the rousing chanting of popular bhajans by the Chowki group. Kshama Kakade and Shardaben added some Gujarati flavor to the otherwise traditional north Indian musical devotional renderings, singing two popular Gujarati bhajans, “Madi taru kanku kharyu ne suraj ugyo” – and “Ghor andhari re rataldi ma nikadiya char asvar-” The uplifting bhajans soon got the enthused Seniors at the prodding of Raj Razdan along with the Volunteer, Chinti Bali, on the floor for spontaneous and joyful garba-like devotional dances. Concluding, devotees offered maiya ka shingar chunari to Mataji with the finale sampurna by bhent (offering), aarti and sampurna ardas followed by prasada (offerings) of Halwa (sweets), Chhole (chick peas), fruits and dry fruits et al. Appreciating and admiring their devotion and commitment, Rewa Handa, along with the sponsors Chinti Bali, Mrs. Sharma, Nikhil Sharma, Ashok & Poonam Datta, and Jagdish & Santosh Shailly were all presented with flower bouquets by Raj Razdan, volunteers Arunaben Patel and Chinti Bali along with appropriate acknowledgment of the generosity of the sponsors. A delicious lunch, catered by the sponsors was served to all who braved the unusualAtlantaJanuary freeze! All the generous donations were split between the Vedic Temple of Atlanta and St Jude’s hospital– a children’s Cancer hospital.